The National Park Service which had originally approved and sponsored a ceremony to be held today at Noon at the Stonewall National Monument to dedicate the Rainbow flag, has suddenly withdrawn at the behest of the White House. The event, however, will go on say organizers. LGBT activists planning the event with NPS officials cite bureaucratic homophobia for the last-minute change in plans, as the President and his White House staffers have systematically rolled back LGBT rights at the federal level since taking office in late January. Organizers of the dedication were informed yesterday afternoon that the NPS is officially passing on their responsibilities of proprietor and caretaker of the nautical flagpole to the City of New York. Fortunately, NPS had already donated the Rainbow Flags to the City of New York and the City has given assurances that the ceremony will go on and that flag will fly permanently. This historic event had originally been planned as the first time that the LGBT flag will wave over federally-funded land, under the permanent stewardship of the National Park Service. NPS personnel were scheduled to speak at the event, but will no longer be in attendance. Despite the change in flag stewardship, the dedication will go forward at Noon today at Stonewall National Monument, located in Christopher Street Park in New York’s Greenwich Village. The park is on the corner of Christopher Street and 7th Avenue South. The event will be emceed by Gay USA television co-host Ann Northrop. Performers will include Telly Leung, who plays the title role in Disney’s Aladdin on Broadway and Cantor Steve Zeidenberg of Congregation Beit Simchat Torah. Speakers will be Leslie Cagan, co-organizer of the 1987 March on Washington for LGBT Rights, Kiara St. James, Executive Director of New York Transgender Advocacy Group, and LGBT and AIDS activist Michael Petrelis, who spearheaded this initiative. Today, October 11 marks the 13th anniversary of the historic 1987 March on Washington for Lesbian & Gay Rights — when the NAMES Project AIDS Quilt was unfurled on the National Mall. The date also marks the annual National Coming Out Day, inviting the LGBT community to live their lives openly. The flag, originally designed in 1978 by the late artist and activist Gilbert Baker, consists of six stripes: red, orange, yellow, green, blue, and violet. When he designed it it had two more colors of the rainbow that have been missing in newer rainbow flags since then. Support for the ceremony is being generously provided by Broadway Cares/Equity Fights AIDS. BC/EFA helps men, women and children across the country and across the street receive lifesaving medications, health care, nutritious meals, counseling and emergency financial assistance. 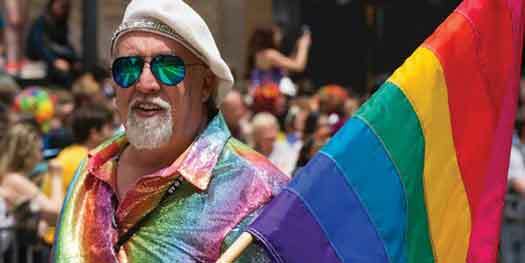 Rainbow flag designer Gilbert Baker died in New York City on March 31, 2017 at the age of 65. Memorials to the internationally known activist were held across the globe in subsequent weeks. The Stonewall Inn was added to the National Register of Historic Places in 1999.